Sorry it's late >.< but hope you like it! I'm back! Well where shall i start - i picked thisscan and started to vector it and omg it took forever nearly lost the will to finish it but got there in the end between starting my new job and moving out so took longer than expected..
With the background i kinda struggled for new ideas and vectoring those sakura weren't going right but i would like to thank sakuraneko for allowing me to use her sakura template i would have done more the the file was HUGE already but main focus is on the girls! Prettyy~! Love the scan you used ^^ Kawaii background~! this is beatiful wall. Love how you vector it especially the outlines. but I think the background is al litte empty. Maybe ad some grass or use more different kind of green. I like the cheerfulness the scan gave, was waiting for someone to wall it. 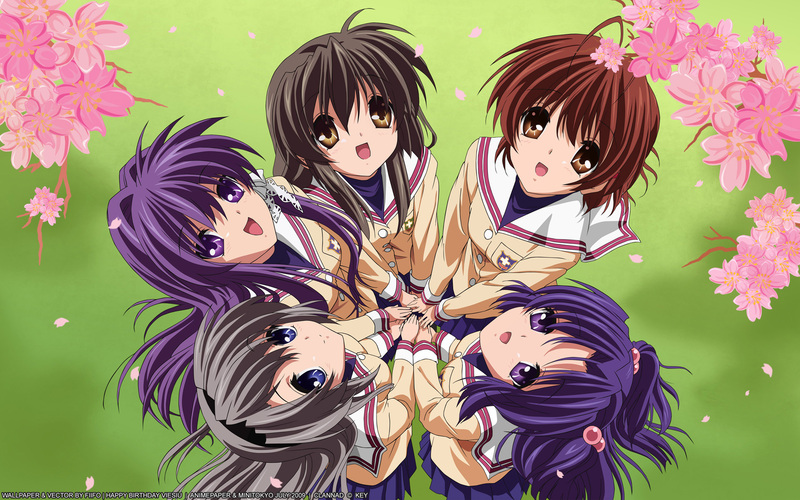 oh my, this is one of the nicest clannad wallpapers ive ever seen! thank u for sharing! I like this anime! is a gift for me to see so many presios together are beautiful, it seems to be the most beautiful flower of all. Las chicas mas lindas de clannad. The color is so detail and love the flower. Great Job.